All minibus day tours depart from the front steps of the National Museum Cardiff, CF10 3NP map - 0900hrs. All walking tours start from Cardiff Castle front entrance at 11am. All tours finish at Cardiff Castle (Castle Street). 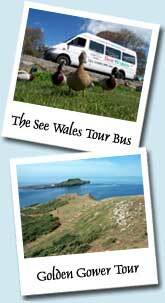 Every See Wales Tour includes: transport, professional driver, See Wales Tours guide, Welsh cakes (day tours). Excludes: Lunch (we stop at convenient and tasty places for lunch on every tour), admissions are not included. See Wales Tours are fun!